You'll be £10.00 closer to your next £10.00 credit when you purchase London Buses 1970–1980. What's this? The 1970s were among London Transport’s most troubled years. Prohibited from designing its own buses for the gruelling conditions of the capital, LT was compelled to embark upon mass orders for the broadly standard products of national manufacturers, which for one reason or another proved to be disastrous failures in the capital and were disposed of prematurely at a great loss. Despite a continuing spares shortage combined with industrial action, the old organisation kept going somehow, with the venerable RT and Routemaster families still at the forefront of operations. At the same time, the green buses of the Country Area were taken over by the National Bus Company as London Country Bus Services. Little by little, and not without problems of their own, the mostly elderly but standard inherited buses gave way to a variety of diverted orders, some successful others far from so, until by the end of the decade we could see a mostly NBC-standard fleet of one-man-operated buses in corporate leaf green. A series of illustrations of interest to those mainly focused on London with a strong emphasis on vehicles. Fine record of a period of change in and around London. If you are an enthusiast for all things London, and especially of the products of the golden age of the UK capital's bespoke buses, then you are likely to lap this up. John Laker was born in Ruislip and began to take an interest in Londons buses as in the late 1940s. In 1957 he bought a camera to start colour photography. Initially, he concentrated on photographing the disappearing British trams and trolleybuses, some examples of which have been published. Mid-career he joined London Transport based at Chiswick Works and remained with them, and later London Buses Limited, where he held the position of Contracts Manager, until taking severance in 1995. Today he is known for his involvement with J & K Video DVDs, which feature his work. 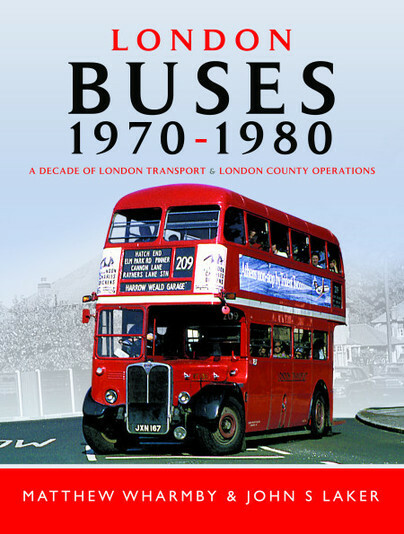 Matthew Wharmby is an author, photographer and editor, who specialises in London bus history. His published books include Routemaster Requiem and Routemaster Retrospective (with Geoff Rixon), London Transport 1970-1984 (with R.C. Riley), The London Titan and The London Metrobus. He has also written many articles for Buses, Bus & Coach Preservation and Classic Bus and London Bus Magazine. This is his fourth book for Pen and Sword, after London Transport’s Last Buses: Leyland Olympians L 1-263 and The London Bendy Bus.